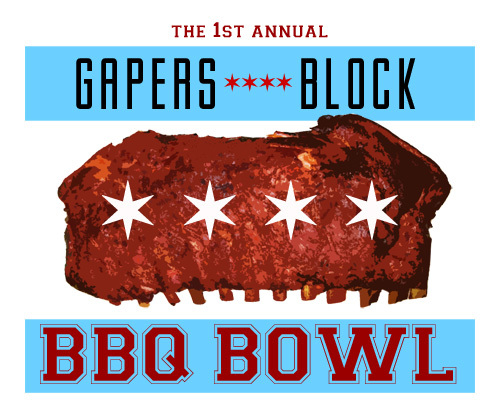 Gapers Block is proud to announce our first-ever BBQ-Bowl barbecue competition, co-sponsored by Club Lucky. Join us from noon to 3pm on Saturday, Feb. 4 for a barbecue battle featuring some of the city's best barbecue joints and restaurants, including Honey 1 BBQ, Honky Tonk BBQ, Mrs. Murphy & Sons Irish Bistro, The Piggery, Pork Shoppe, Rub BBQ Company and host Club Lucky. $25 at the door or in advance will get you admission, one tasting from each BBQ contestant, and your choice of two Southern-inspired sides prepared by Club Lucky's executive chef, Alfredo Anaya. Additional sides may be purchased for $3. Club Lucky's bar will be mixing up special cocktails and dishing out beers all afternoon. And Koval Distillery will be conducting tastings of several of their best organic whiskeys. Once you've made your way around the competitors, cast your vote for the "People's Pick" award at our polling booth. A panel of esteemed judges will also vote for the "Critic's Choice" award. This year's champions will be announced at 2pm, with a special performance by musical guest The Congregation to follow. You'll be able to get seconds of barbecue and sides until 3pm. Club Lucky is located at 1824 W. Wabansia Ave. in Bucktown. Contact events@gapersblock.com (or comment below) with any questions, and watch this space for updates. See you there! Be there or be square y'all!